In the gloom of January — often a dumping ground for uninspired movies that nobody was going to see anyway — comes a rare bloom: Paddington 2, the sequel to 2014’s Paddington, is better than the first film. Yes, this is still a rather silly movie about a talking bear, but we look for light where we can. Paul King is back in the director’s chair to bring to life another tale of the amiable, if clumsy, bear, once of “darkest Peru,” now of London. Paddington — named for the train station where he was discovered by the Brown family — is the much-beloved literary creation of Michael Bond; the bear has had many adventures over the decades, but contemporary cinematic effects have made them considerably flashier. King has rounded up the old gang for this second outing: Ben Wishaw voices the computer-animated Paddington; Hugh Bonneville and Sally Hawkins return as Mr. and Mrs. Brown; and Imelda Staunton, Michael Gambon, Julie Walters, Jim Broadbent and Peter Capaldi reprise their various roles. New are: Hugh Grant, in the prized comic-villain role; Brendan Gleeson, as a soft-hearted prison cook; and Tom Conti and Joanne Lumley in small roles. It is quite the round-up of respectable British actors, and it all helps to keep this piffle motoring along nicely. A hammy actor as the bad guy is a much more entertaining foil than the rather bizarre mad taxidermist that Nicole Kidman portrayed in the first film. Also, some of that earlier film’s franticness has been toned down; when a film’s big climax involves a steam train, one can hurtle only so fast. And familiarity with the characters means less time spent establishing them, and more time for just enjoying who they are. Of course, things still must go comically sidewise for our plucky bear. Through a series of misunderstandings and bad haircuts, Paddington winds up in jail, where he wins over the hardened criminals by whipping up a batch of his preferred sustenance, marmalade. 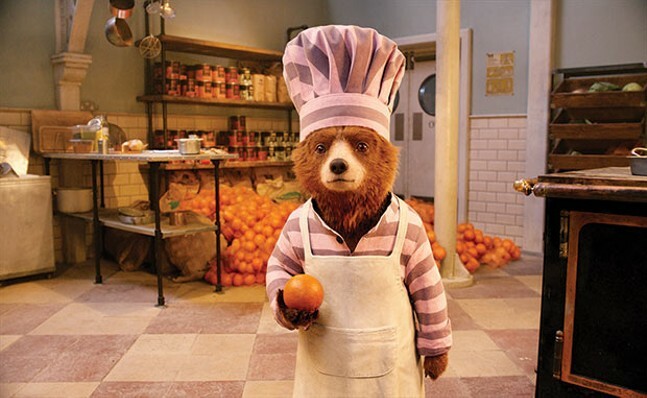 This subsequent culinary awakening and a laundry mishap that turns the prisoners’ outfits pink greatly expands Paddington’s wink-wink fascination with feminizing men; a highlight of the first film was Bonneville — best known as the stuffy Lord Downton — passing himself off as a cleaning lady. And don’t miss the end credits, which — while stealing a gag from a long-ago Simpsons episode — nonetheless is a total campy delight.